The Roland XS Series - the new line of Multi-Format Matrix Switchers designed for fixed installations requiring high-quality integrated video and audio conversion and switching. Version 3.0 introduces powerful new features for live events and enhanced audio matrixing. A single unit solution for total control of video and audio that is flexible enough to meet the diverse needs of classrooms, conference rooms, live presentations and events. The XS-82H is the 8-in x 2-out version feauring HDBaseT outputs. 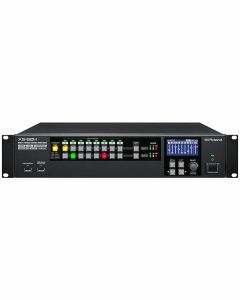 The Roland XS-82H is deliberately engineered for fixed installations that necessitate premium integrated video and audio conversion and switching. The XS series provides a built-in environment for routing and switching HDMI and analogue sources and digital displays. The mixer allows for high-speed switching for HDMI, RGB, component, S-video, and composite video. Powerful DSP means the switching and mixing of audio inputs is well within the XS-82H's capabilities. Up to four audio mixes can be furnished from both analogue audio inputs as well as embedded HDMI audio inputs. The outputted mix can be embedded back into the HDMI/HDBaseT outputs as well as analogue audio outputs. The XS-82H is versatile, enabling eight HDMI, RGB/Component/S-video/Composite inputs and up to two HDMI or HDBaseT outputs with scalers to support picture-in-picture, resizing, rotating, and flipping. Audio can be embedded into outputs via eight stereo audio inputs (two mic) and/or HDMI audio as well as de-embedded HDMI audio on output. Additional features include iPad control, EDID emulation and HDCP management. * The output refresh rates of 640 x 480–1366 x 768 are 75 Hz when the unit’s frame rate setting is 50 Hz. * Conforms to VESA DMT Version 1.0 Revision 11. Weight: 5.3 kg / 11 lbs. 11 oz.